I came to bird photography rather circuitously: teaching German at a small college in the Swiss alps, university teaching and research in Canada, briefly selling old master paintings (very briefly), analyzing securities for German banks. My wife Marylee Bomboy was already an enthusiastic birder when we met in 1994, and she quickly got me hooked. By my retirement in April 2000, I was fully dedicated—and imagining how wonderful it would be to capture images birds on film. After trying her hand-me-down lenses, my first serious photographic outing was to California in 2001—still with film, and bird photography soon became all encompassing. I switched to digital in 2003, donating my last two dozen rolls of Velvia 50 to a camera club. We moved from New York City to Northampton MA in 2003, but we travel frequently—in North America, Europe, and Central America. My favorite spot in New England has been Mass Audubon’s Allens Pond Sanctuary near New Bedford MA, where piping plovers, least terns and osprey nest. Mass Audubon have used my images in support of their activities. I’ve made digital slide presentations to our local Hampshire Bird Club in Amherst nearly every year since 2006. The HBC produced a T-shirt with my images (on the right) to mark its 25th anniversary in 2009, and a second version in 2016. 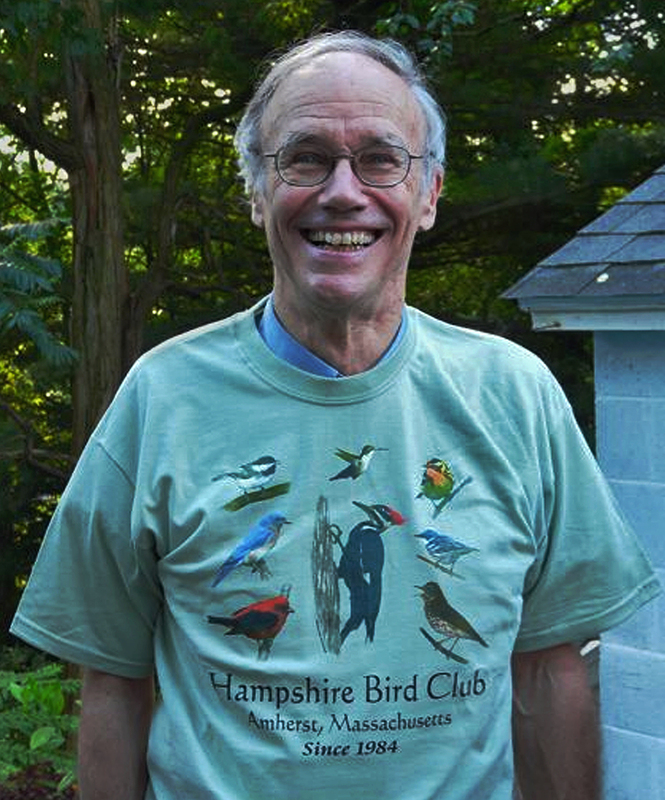 I’ve presented as well to many other bird clubs in New England and to several photography clubs. I especially enjoy giving shows to to school-age children (e.g summer nature campers at the nearby Hitchcock Center for the Environment). I’ve had print exhibitions at the Burnett Gallery in Amherst, the Fish and Wildlife Service in Hadley, Wellfleet Bay Audubon Sanctuary on Cape Cod, and both Joppa Flats and the Parker River NWR Visitor Center on Plum Island. I’m an active member of the Pioneer Valley Photographic Artists. I also post daily on blipfoto, a kind of photo blog–one image per day with commentary (birds when possible).